Believers get whiney and petulant when we delete God from “in the beginning,” so, for the sake of argument, let’s wipe their tears and soothe their troubled spirits by granting that a god must have launched the Cosmos—pending the latest updates from cosmologists. But give Christians that inch and they’ll take a light year. 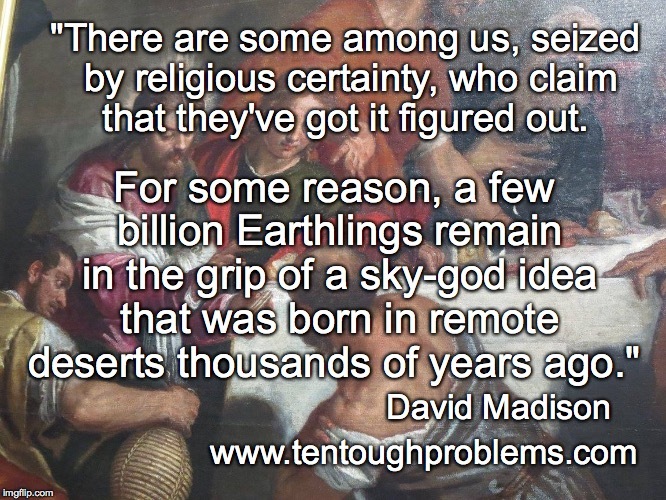 They overreach and rush in with assumptions and faith babble. They’ll want to push the Bible agenda. Their swarms of ideas about their god are as deeply entrenched as the belief in god-the-originator. They leap to the conclusion that the God described in the Bible is the one that triggered the Big Bang. And they’re shocked to be told that this doesn’t follow at all. God is God . . . what’s the problem? Well, here’s the problem: The Christian god—the jumble of ideas about god in the Bible—was little late arriving on the scene. According to the latest refinement of the data, the Big Bang took place 13.82 billion years ago. The Earth formed from galactic dust and debris about 9.3 billion years after that. The Cambrian Explosion is now dated at about 550 million in the semi-distant past. Homo sapiens came along maybe 1.5 million years ago, and religious impulses probably emerged as soon as these sentient beings learned to be afraid of death. The Sumerians invented writing some six or seven thousand years ago, thus allowing for the dispersion of ideas, especially in the form of religious texts. Perhaps as early as 1,500 years B.C.E., the people whom we now call the Hebrews began worshipping a jealous tribal god who was in a bad mood most of the time—the record of his nasty disposition is called the Old Testament. He was known as Yahweh (put in different vowels and you get Jehovah). Over the centuries, the Hebrews—especially after they had become the Jews in the 6th century B.C.E.—arrived at the conclusion that Jehovah was the one and only god. Their major contribution to Western thought was monotheism, most brands of which have shown a remarkable capacity for intolerance. One especially malignant version insists that a human sacrifice—of a backwoods Galilean peasant, no less—was required to deflect the wrath of the god. That this peasant might have claimed to be the son of a god—the texts are unreliable—only compounds the silliness. Theologians have been massaging, refining, and knocking the rough edges off this idea for more than two millennia. But the tribal god behind it all was one of many, all of whom were the brain droppings of illiterate desert nomads living long ago and far away from us—but only very recently on the cosmic scale of time. They were making guesses about the gods, as were all other ancient peoples. Why should we trust them? There is no reason to suppose that they were on to something or had special insights into cosmic origins. The Hebrews thought that their god spoke out of a burning bush. Give me a break. Their religion fails the test of cosmic respectability. It doesn’t fit the big picture. 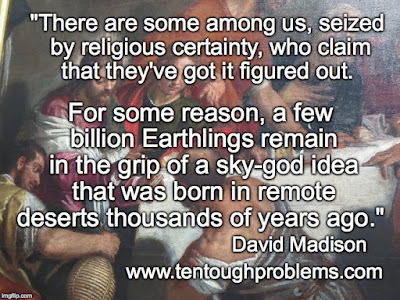 This is the god who ignited the Big Bang and launched billions of galaxies?< David Madison was a pastor in the Methodist Church for nine years, and has a PhD in Biblical Studies from Boston University. His book, Ten Tough Problems in Christian Thought and Belief: a Minister-Turned-Atheist Shows Why You Should Ditch the Faith, was published by Tellectual Press in August.